A digital amp that's really as good as valves? All things considered, the THR100HD could be a game-changer. Great value. Packed with features. When Yamaha came up with the THR combos a few years ago, a lot of guitar players liked the novel 'third amp' concept that drove their design. You had your big amp for gigs and a smaller one for band rehearsals, so what you needed was a small, unobtrusive, lounge-friendly amp that wouldn't annoy your significant other by taking up valuable floor space. Add stereo speakers, great onboard effects and a handy USB recording interface, and the THR was a great success. 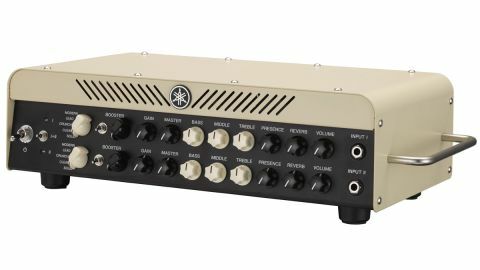 So much so in fact, that lots of THR users started to use the amp for gigs as well, which in turn drove the development of the head you see here - the all-new THR100HD. It's a THR, but this time one that's intended for live use. So what makes the new head so impressive? Well, for a start, it has Yamaha's THR front-end, which we already know sounds great, but what makes the THR100HD special is its clever digital power amp, which faithfully mimics the operation of real valves. Then there's the fact that with the THR100HD, you get two of everything: two preamps, both with a built-in booster function that behaves as a stompbox; two effects loops; two power amps; two XLR line outs; and if you use it, Yamaha's specially designed dual mono speaker cabinet, which has two different-sounding loudspeakers. Many pro players use separate amps for clean and lead sounds, and often combine them; that's how those elusive lead sounds that have distortion with no loss of clarity are made, and this is the THR100HD's party trick. "There are superb Fender-influenced cleans, bluesy touch-sensitive crunches and a choice of classic or modern lead tones, all footswitchable for your convenience." The THR100's cream steel case has the same character as the THR combos, with pleasing proportions and a hint of Art Deco from the angled slots over the controls. The control layout cleverly hides the fact that inside the THR100HD are two seriously powerful Yamaha digital signal processing chips. The interface is entirely analogue, with no LCD displays, no presets or confusing buttons with hidden features. What you see is very much what you get, with a five-position amp voice selector, which packs three overdrives - crunch, lead and modern - and two cleans: solid, and er, clean. There's also a channel volume control, because the master volume control works inside Yamaha's Virtual Circuit Modelling environment, adding more drive to the THR's digital power amp simulation, which in turn has five different valve choices, as well as Class A or Class A/B operation. Yamaha has restricted onboard effects to reverb only, but these come from their SPX library and are as good as those found in many top studios. You also have two effects loops, which can be used separately or combined and used as one for both channels as needed. Lurking on the rear panel are two speaker-simulated balanced XLR line-outs, with a ground lift switch that uses the latest Impulse Response cabinet simulation. There's also a USB socket, which lets you hook up the THR100 to your PC or DAW for recording, as well as tweak some aspects of the amp from a handy offline editor. Again, Yamaha keeps this really simple, with a choice of three different boosters and four reverbs. You can change the effects loop mode from series to parallel, activate a noise gate, and load your IR data for the cab emulation, and of course, save all of this separately for both of the channels. All of this sounds great of course, but does the THR100HD sound any good? In short, yes, it absolutely does. There are superb Fender-influenced cleans, bluesy touch-sensitive crunches and a choice of classic or modern lead tones, all footswitchable for your convenience. They sound so convincing it's really hard to believe there are no valves. The interaction of the clever digital power stage with the loudspeaker is just like that of a good valve amp, and the virtual valve choices are uncannily authentic. The reverbs are superb, but some are a little on the bright side - we'd like to see a simple tone control added to the offline editor app.